tortisima eats corn, a photo by hep on Flickr. here is some cute for you. 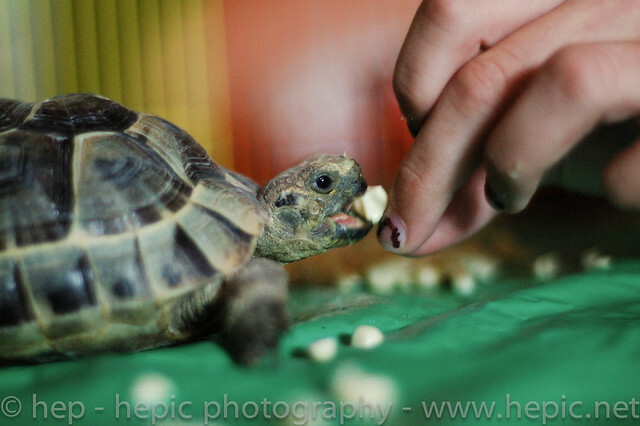 zane feeding her pet tortoise a kernel of corn. OH MY! Tortoises are so flippin cute when they eat. soooo cute! and nice touch on the nail polish. i would be scared of tortoise bites tho. her mouth isn't big enough to really bite yet, and tortoises do a "taste bite" at first with each bite that isn't as powerful as their mastication bite. so it's like a tiny nip, not even hard enough to leave a dent. narmmm like a love bite! yeah its super cute. she is also really good about sizing up where the kernel will be before she bites the first time. i might take a movie of it because its really cute. So so cute. I love that you allow your kids pets and to learn about the responsibility of pets...my mother always let us have them if we took care of them. My sister never lets her kids have pets and they have grown up afraid of animals...which is completely foreign to me. That is just the cutest picture!